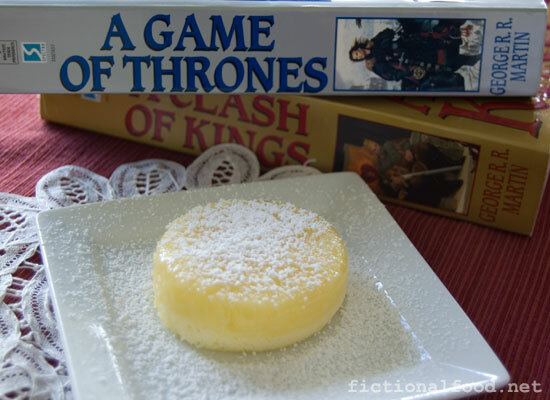 With Game of Thrones premiering tonight, I made some lemon cakes, Sansa Stark’s favorite. How the heck cooks manage to make lemon cakes while on the road is beyond me, but somehow Sansa manages to get some on the way to King’s Landing. I was pretty scared to do them because they looked intimidating. I didn’t understand how the heck it you could get the pictured result from the recipe. Surprisingly, it did turn out just as pictured, though mine were shorter due to me having 5 oz ramekins instead of 4 oz. I’m not sure if it’s the water level or if it’s from the lighter ingredients rising to the top, but the dark yellow “glaze” on top is really delicious, while the light yellow spongey cake part on the bottom just melts in your mouth. Very delicious!